Those are my thoughts several years ago as I commuted home by bicycle. Enjoying the rush of air, the warmth of the sun on my back, the fresh air of the path and the serenity of a commute without traffic. An unrushed pace as I traveled home. Letting the day unwind with the exercise of my muscles. Letting my mind sort the days stresses with the gift of fresh oxygen being circulated throughout my body. For several years I lived car free. This time was difficult and freeing. Through that time I learned much about bicycle commuting. When done well it is a wonderful way to keep your mind and body fresh, your wallet heavy and to be kind to mother nature. It is simple enough to get yourself killed on a bicycle, and simple enough to keep yourself safe. Here are some of the lessons I learned and thoughts on the subject in no particular order. 1. It’s fun. Plain and simple. I stopped riding my bike regularly when I was 15. Started again when I was 28. In that absence I hardly even thought about it, much less considered it a form of transportation. When I decided to ride a bike for transportation it was for all of the solemn reasons one could think of. Better for my health, better for my pocket book and better for the earth. You know what though, I continued to bicycle commute because it was just plain fun and I enjoyed it. I liked not having a car payment, I liked the physical fitness aspect, I liked being better to the earth, but I loved riding my bicycle. Cleansing my mind and rushing through the streets on two self propelled wheels. Plus…parking is always quicker and easier on a bicycle. 2. Ride in the lane. It’s yours, the roads were originally paved and smoothed out to facilitate bicycle travel. Take advantage of that. Your taxes pay for the roads. Highways are paid for by the specific taxes on gas, licensing, registration and tolls. The local roads are built and maintained from the general fund and you’re already paying those fees. So…you pay for the road too. In most communities (all are different so you should check with local authorities) a cyclist must ride as far right as is practicable or they may take the lane if you are unable to safely fit the width of one car, the cyclist and three feet or so in the same lane side by side. For most lanes that means that you own the lane. If you do take the lane take it on the left 1/3 of the lane. Riding further into the lane makes you more visible to traffic and removes the temptation for the driver to buzz past you by trying to go around you. It requires them to change lanes, and that requires them to think and to acknowledge you. 3. Stop using hand signals designed for driving a car. Point to where you want to go. No one knows that your left arm bent at 90 degrees up means to turn right, but everyone understands pointing to the right. Before the advent of the car this is what you did. Simply pointed out your intentions. After the car you couldn’t reach out the right side of the car so they created these hand signals. Feel free to use stop or a hand behind you to indicate slowing down. I think these are understood. I would typically take whichever hand was free and use that as an indicator to slow down, using my hand down, palm back. 4. Traffic lights and the rules of the road: Do you follow every traffic light or stop sign? I know I certainly didn’t. Bikes are different machines than cars. We propel ourselves with our muscles and every bit of forward momentum is a bonus. With that being said I believe that it is very important to show yourself in a good manner in front of motorists. A motorist doesn’t understand that being perched atop your bicycle and slowing a bit as you come to an intersection allows you a much more favorable view of that intersection. All they see is yet another rider breaking the rules. Even though you might not care what they think as you ride your bike around your city you have to remember that the impression you leave with the non cycling world is the one that they take to the ballot boxes as you fight for more cycling infrastructure. As far as stop signs go just about everyone, cars included, do a rolling stop. Idaho has a statute on the books for bicycles which essentially legitimizes some common cycling practices. Just because it is legal in Idaho doesn’t mean that it is legal in your neck of the woods so proceed with caution. It is also very important to choose the appropriate roads to ride on. If you can’t keep up with traffic and you are on a one lane road with no chance of a car getting around you then you should probably choose a different route. If there are two lanes and cars can get past without any incidence then I feel as though you can own the appropriate lane. As you become a more experienced bicycle commuter you’ll find that you know every back road in the city. Furthermore, when riding your bike near parked cars you should always be aware of car doors opening into your path. If you allow yourself to get pinned between traffic and parked card then you are setting yourself up to run right into an unsuspecting door. Therefore you must take the lane. Do not ride on a sidewalk. Cars are not expecting you to be there and the speed at which you are traveling will lead you right into their path as they cross that sidewalk to pull out into traffic. 5. Feasibility and my setup. I have a Surly Long Hail Trucker with a rear rack, fenders and a monster bike lock by Kryptonite. 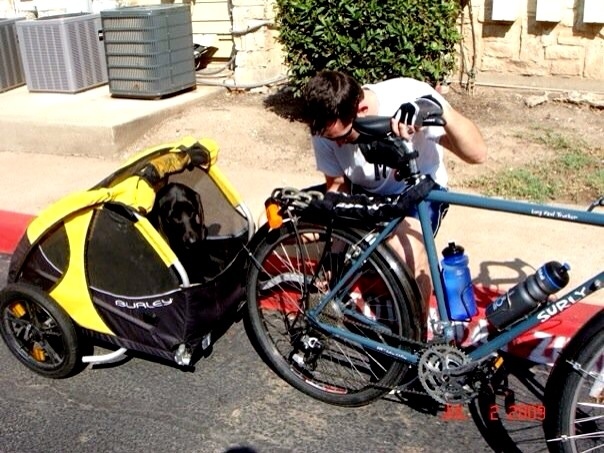 I also have two Panniers by Arkel (T-28) and a burley trailer to tow my dog. I love my setup. It kept me on my bike alone for two years. I never felt as though I was in need or wanted anything further. I loved the lower gears for towing my pup and I was able to go plenty fast. I used to carry a lot of gear for work as a Paramedic and I was always able to carry it with the above setup. Fitting it all onto my rear rack and into the panniers. This included a bullet proof vest, helmet, flash fire gear, boots and several uniforms. So, is it possible to survive on your bike only? Yes, it certainly is, however it takes some planning and work initially to learn it. It’s tremendously rewarding though once you figure it out, plus monetarily helpful. If you are interested in trying it I say go for it. It’ll be a great experience. You might just gain independence, freedom and a higher level of fitness.